Lynne found an ad for Whites Mini Horse Petting Farm in the "Points of Interest" section of the Portsmouth yellow pages. She called, and they gave her excellent directions. It is about four miles north of Route 4 about halfway between Concord and Portsmouth. 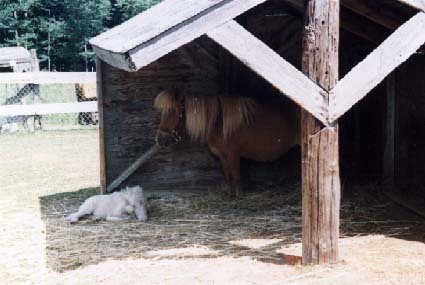 The white colt lying on the ground by its mother was born the day before this picture was taken. 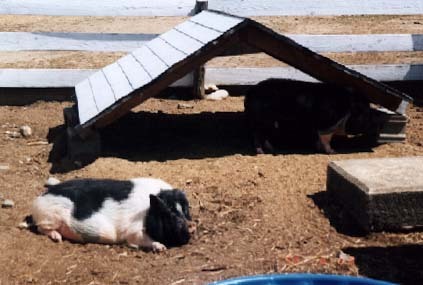 Whites also breeds and sells Vietnamese Pot Belly Pigs. 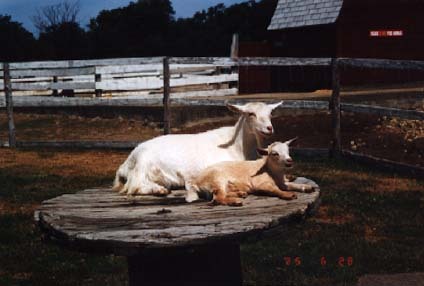 These goats are enjoying the sun. We saw two kid goats born. Here, the second one is less than a minute old. It looked like nanny goats have a much easier delivery than humans.